Green Gutters Getting You Down? Clean Nation can transform your home & leave them sparkling! 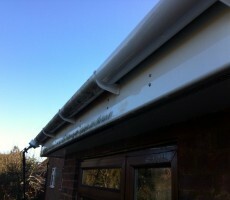 In most cases we can reach all the gutters, fascia and soffit on a house without using ladders. Do you use harmful detergents? Usually we can clean all your external PVC using only the power of de-ionised water, but on some really dirty jobs we may need to add a little detergent to get the best results. The detergents we use are child and pet safe, and wont damage your flowers or lawn. How often should my fascia be cleaned? We usually recommend annual cleaning, but if you’d like your fascia & soffit cleaned more regularly we’ll be happy to arrange a schedule that suits you. The damp British climate can quickly take it’s toll on PVC gutters, fascia, soffit and downpipes, but Clean Nation can get them sparkling again! Our high reach cleaning system allows us to clean most fascia and soffit without using ladders, and we can reach the cladding at the sides of dormer windows too. We use the power of ultra purified and de-ionised water, along with specially designed soft brush heads to gently remove the grime, traffic film and algae. The constant flow of clean water washes the dirt away leaving nothing behind but the shine. Use the form below to contact Clean Nation via e-mail. We aim to respond to all e-mail messages within one working day, but if your query is urgent it may be quicker to contact us by phone.